Salaam-e-Ishq: A Tribute To Love is a 2007 Indian romantic drama. Directed by Nikkhil Advani, it featured an ensemble cast of stars including Akshaye Khanna, Ayesha Takia, Salman Khan, Priyanka Chopra, Anil Kapoor, Juhi Chawla, John Abraham, Vidya Balan, Govinda, Shannon Esra, Sohail Khan and Isha Koppikar in lead roles. The movie weaves six love stories together thanks to the relationships of the people within it. The film was Advani's second directorial venture after Kal Ho Naa Ho and remake of the Hollywood movie Love Actually. The shooting for the film begun in 2004 and was finished by 2006. The movie released on 26 January 2007. The film met with negative reviews from critics and recorded as disaster at the box-office. Born in Dehra Dun, temperamental and ambitious Kamna changes her name to Kamini Ranawat (Priyanka Chopra), hires Babu (Tinnu Anand) as her manager, and becomes one of the most sought-after heroines in Bollywood. As a publicity stunt to change her image from item queen and to get the attention of filmmaker Karan Johar, she says that she is in love with a man named Rahul. In London, a man saying that he is Rahul Khanna (Salman Khan) poses as her childhood sweetheart and future husband. Kamna has to play along or she will not get the film deal she was looking for with Johar.This results in a dilemma for her as Rahul reveals that he loved her back when she was Kamna, and she has to choose between her career and Rahul. Kamna initially chooses her career but soon realizes that she is in love with Rahul when she cannot stop thinking about him. Kamna turns down Johar's movie offer and hunts down Rahul at Gia Bakshi (Ayesha Takia) and Shiven Dungarpur's (Akshaye Khanna) wedding, where she proposes to him. Gia lives with her father Col. Bakshi (Prem Chopra) and is in love with Shiven. Both are to get married shortly, but Shiven starts to get cold feet thanks to a few misleading words about marriage from his friend Juggy (Vishal Malhotra). He decides to disappear from her life, leaving Bakshi no alternative but to arrange Gia's marriage with Rohit Chhada (Kushal Punjabi). However, Shiven remains heartbroken and cannot stop thinking about Gia. While driving one day, he accidentally hits Tehzeeb Hussain (Vidya Balan), who is walking on the road, and helps her reunite with Ashutosh Raina (John Abraham). As he sees the pair reunite, he realizes that he cannot let Gia go. He rushes to her wedding with Rohit and stops the wedding, professing his love for Gia. Shiven and Gia get married. Gia's sister Seema (Juhi Chawla), who lives in Britain, has been married to Vinay Malhotra (Anil Kapoor) for 15 years, and they have two children. Vinay sees his life as boring and dull until a woman named Anjali (Anjana Sukhani) comes into his life. The two start to meet and begin an affair, but while preparing to travel to India for Gia's marriage, Seema finds out about Vinay's affair, leaving her heartbroken. Vinay is left to choose between Seema and Anjali. He chooses Seema and runs to the airport as she is leaving for India with their children. Vinay apologizes to Seema, and the couple reunites. Ashutosh is a Hindu but falls in love and gets married to Tehzeeb, who is Muslim, much to the chagrin of his father (Anang Desai), who will not have anything to do with him. Tehzeeb is a TV news reporter; while travelling on an inaugural train route, the train derails. Tehzeeb survives but loses her memory and is unable to recall who Ashutosh is – and may end up leaving him and returning to her parents' home. Ashutosh takes Tehzeeb to his parents' house where they first met so that Tehzeeb can restore her memories, but he must deal with his father in order to help her. Tehzeeb is overwhelmed and runs away. She is accidentally hit by Shiven's car. Shiven calls Ashutosh, and they bring Tehzeeb to Shiven's house to rest. When Tehzeeb wakes up, she wants to leave Ashutosh and go to her family's house because she is tired of seeing him sad when she is unable to remember who he is. Ashutosh tells her that even if she cannot remember their past, the couple can form new memories together. He also tells her that without her, he has no present or future and that whatever the future brings, the couple will be able to face together. Tehzeeb and Ashutosh then reunite and resume their life together. A few years later, they are back to being the loving couple that they were before Tehzeeb's accident. Raju (Govinda) is a taxi driver who comes to the assistance of a white woman Stephanie (Shannon Esra), who is frantically trying to hunt down her lover Rohit. While Raju drives her around all of Northern India searching for Rohit, he falls in love with her and drops her off to the venue where Rohit is getting ready to marry Gia. However, it turns out that Rohit does not want to marry Stephanie because he wants to marry an Indian girl and tells her to get lost. Raju slaps Rohit across the face and confesses his love for Stephanie. Stephanie confesses her love for Raju, and the couple unites. Ramdayal (Sohail Khan) weds attractive Phoolwati (Isha Koppikar) and would like to spend some intimate moments with her, but comical circumstances prevent him from doing so. On the day they get married, Ram accidentally sets the room on fire, thus ruining his and Phoolwati's first night. One night, Ram gets kicked out of a brothel when five kids see him kissing Phoolwati. Ram and Phoolwati hid in a car but got injured when the car crashes into a house. Then, while travelling together on a train, they somehow manage to scare away the passengers from the compartment they are sharing, so they finally get their romance time. The music of the film was released on 2 December 2006 at Grand Hyatt, Mumbai by T-Series. It has seven songs composed by Shankar-Ehsaan-Loy with lyrics by Sameer. This is the second film of Nikhil Advani together with the musical trio. Their first venture Kal Ho Naa Ho had earned Shankar-Ehsaan-Loy the National Film Award for Best Music Direction. This soundtrack consisted of seven tracks. The track "Babuji" from Aar Paar was remastered and used for the album. Actor Akshaye Khanna who plays Shiven in the film commented on the music, saying, "Salaam-E-Ishq has the best music I have heard in the last 10 years. The album is outstanding. It is definitely Shankar-Ehsaan-Loy's best work till today. It has very unique sounds, and Sameer's lyrics are also fabulous. It is not the type which will become obsolete after a point of time. You will want to pull out its CD even after fifteen years and listen to the music." Anil Kapoor too, echoed the same sentiments, saying the album was best to come out of Bollywood in a long time. The album was met with positive responses and good commercial success. 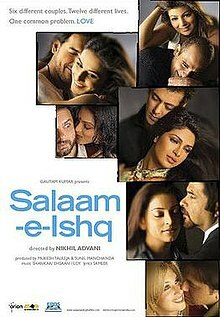 Sukanya Verma of Rediff in her four-and-a-half star review, remarked, "Salaam-e-Ishq is a well-designed, wholesome soundtrack with emphasis on melody, beat and innovation. Featuring seven individual tracks, no sad versions or technically damaged retakes. It is seven out of seven! The musical trio succeed in getting the perfect score." Joginder Tuteja of Bollywood Hungama too gave the album a positive review, stating, "Each of the songs of Salaam-E-Ishq boasts of high quality music. There are some new sounds interspersed with the kind of music that goes well with the Bollywood scheme of things and the final result is something that is going to stay with you for many more months to come." The Glamsham review read, "The musical trio has infused different musical beats, style and concepts with élan in tracks in 'Dil Kya Kare' and 'Saiyan Re' and has entertained with title track. Hear it for different musical flavors and you will feel the versatility of this high profile album and the musical flamboyance of musical trio." The film received mostly negative reviews from critics. Film critic Taran Adarsh cited "a disjointed script, abstract style of narrating the story and excessive length" as the film's main deficiencies. Rediff.com's Sukanya Verma called it "an ode to mediocrity, not love or cinema". However, Poonam Joshi of Channel 4 praised the film for its "clever storytelling, parody and brazen wit". The film received a 1.5-star rating from IndiaFM and a 4-star rating from Channel 4. The film was declared a disaster by Box Office India. ^ Adarsh, Taran. "The spectacular music launch of Salaam e Ishq". Sify. Retrieved 23 June 2011. ^ Adarsh, Taran. ""I don't have a favourite genre of movies but I wish Bollywood would make more adventure movies": Akshaye Khanna". Bollywood Hungama. Archived from the original on 6 January 2010. Retrieved 24 January 2017. ^ Adarsh, Taran. ""My children are embarrassed about me" – Anil Kapoor". Bollywood Hungama. Archived from the original on 20 February 2011. Retrieved 24 June 2011. ^ a b Joginder, Tuteja. "Salaam e Ishq: Music Review". Bollywood Hungama. Archived from the original on 18 January 2013. Retrieved 24 June 2011. ^ a b Verma, Sukanya. "Salaam-E-Ishq: Awesome music". Rediff. Retrieved 24 June 2011. ^ Toolsee, Gianysh. "Salaam E Ishq – Music Review". Planet Bollywood. Retrieved 24 June 2011. ^ Satyajit. "Salaam E Ishq Music Review". GlamSham. Retrieved 24 June 2011. ^ "Music Hits 2000–2009 (Figures in Units)". Box Office India. Archived from the original on 24 June 2010. ^ "rediff.com: 2007's Top 10 Music Albums". Specials.rediff.com. Retrieved 8 March 2012. ^ a b "IndiaFM". Salaam-e-Ishq. Retrieved 2 May 2007. ^ "Rediff News". Salaam-e-Ishq: Stars shine in mediocre film. Retrieved 2 May 2007. ^ a b "Salaam-e-Ishq". Channel 4. Retrieved 2 May 2007.